We're got some super cute pen-pals in Minnesota. Who doesn't love mail? 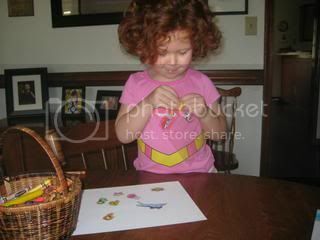 Especially mail that contains stickers, adorable pictures and dictated thoughts from a preschooler's mind? 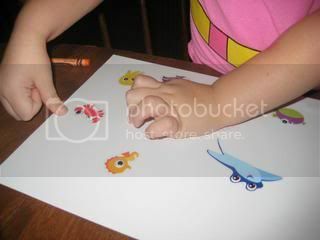 Depending on the ages of the children involved, actual letters or key words can be written, making a great writing activity. Our kids like asking each other questions and slapping a few stickers on a page and calling it good. Here are S & B working on their latest package for Z and J, my friend Megan's kids. 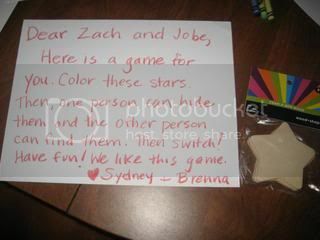 This time we included a little activity the girls have enjoyed before... a package of wooden stars to color, with instructions for a little hide & seek game. We hope they like it! 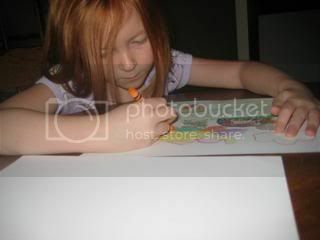 We just bought a card to start a pen pal project, fun fun fun!